We are Jim and Angie Leonard. 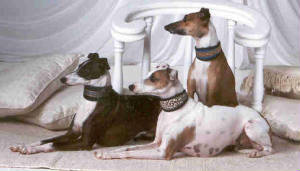 Our love for the Italian Greyhound has led us on a wonderful journey that we hope to continue for years to come. Our goal has always been to breed an Ig that meets the standard. We believe strongly that a breed should function as it was originally bred to. For the Ig, they should be the ultimate lap dog and companion. To be that, we believe they must not only be pretty to look at but, most importantly be healthy of body and mind.